This coming weekend, a year&apos;s worth of effort by some 16,500 student volunteers at Penn State will culminate in a 46-hour dance marathon to help children fight cancer. 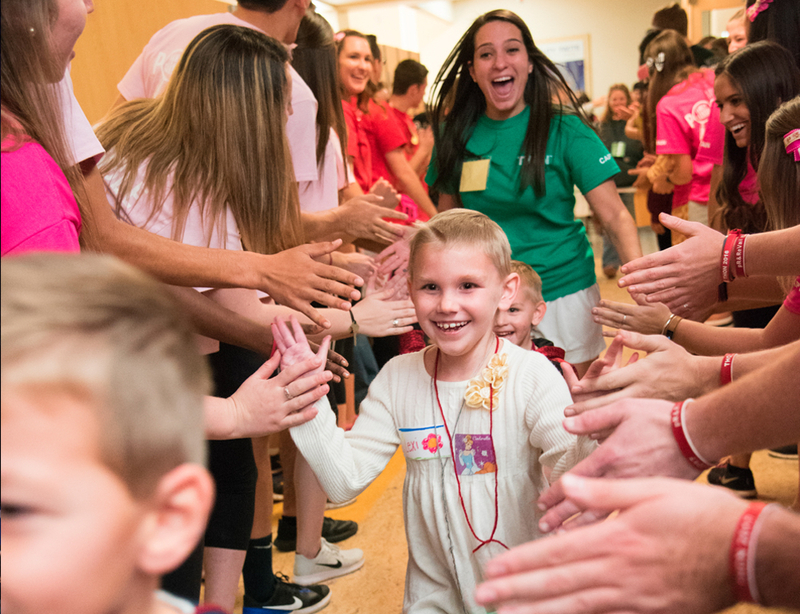 The sole beneficiary of the Penn State IFC/Panhellenic Dance Marathon – or THON – is Four Diamonds, which works to conquer childhood cancer through superior care, comprehensive support and innovative research. Four Diamonds covers 100 percent of all medical expenses related to cancer care not covered by insurance for eligible Four Diamonds children. Each year, Four Diamonds provides financial, social and emotional support for about 500 families, while also funding research designed to both find new treatments and make existing therapies better. Four Diamonds works to remove external burdens so patients and their families can focus on getting through some of the most challenging times of their lives. In addition to paying medical bills, it supports services such as nurses, a dietician, a psychologist, social workers, teachers and music and art therapies. Dr. Barbara Miller, chief of pediatric hematology and oncology at Penn State Children&apos;s Hospital and associate director for pediatrics at Penn State Cancer Institute, said THON&apos;s support of Four Diamonds makes possible the development of new programs, including a survivorship clinic that began in 2009 to provide follow-up care, screening and recommendations for those who are off therapy following treatment of pediatric cancer. Another Four Diamonds-supported program, started a year and a-half ago, aims to provide treatment for adolescents and young adults with cancer up to age 21, and help them manage their disease better. The newest addition is a pediatric cancer genetics program—one of only 30 in the country–that offers screening to both new and existing patients to determine genetic predispositions for childhood cancer. If patients are found to have a genetic predisposition for childhood cancer, then they warrant closer attention such as increased surveillance for secondary or new cancers. Screening of their siblings may also be recommended. “There is a lot yet to learn about genetic predispositions and what they mean, both for therapy and for future risks,” said Miller. Research funded by Four Diamonds is advancing the field in ways that impact childhood cancer patients worldwide. Dr. Valerie Brown, director of experimental therapeutics in the Children&apos;s Hospital&apos;s Division of Pediatric Hematology and Oncology, said it is imperative to develop innovative and cutting-edge therapies to help cure those patients who do not respond to conventional treatments. “When you make the investment in research, you have the potential not only to save more lives, but also to minimize the short- and long-term effects of treatment which is particularly important in children and adolescents with cancer,” Brown said. More than 80 doctors and researchers work in seven laboratories to unlock the secrets of cancer cells and develop therapies to target them. Miller said the goal is to increase cure rates and decrease side effects. Miller, Brown and other investigators in the Four Diamonds Pediatric Cancer Research Center often attend national and international meetings and conferences to share their research and to learn and collaborate with their colleagues to develop innovative research ideas. Because of her role as a physician scientist, Brown works as a translator between the clinical and basic science research realms, identifying gaps in treatment in the clinic and developing basic science observations into feasible, but novel, clinical trials. The resources provided by Four Diamonds and THON make all of it possible.